Bianchi Watches designed in Italy with Swiss movement. Bianchi has diversified its cycling product range to include also wa­tches. 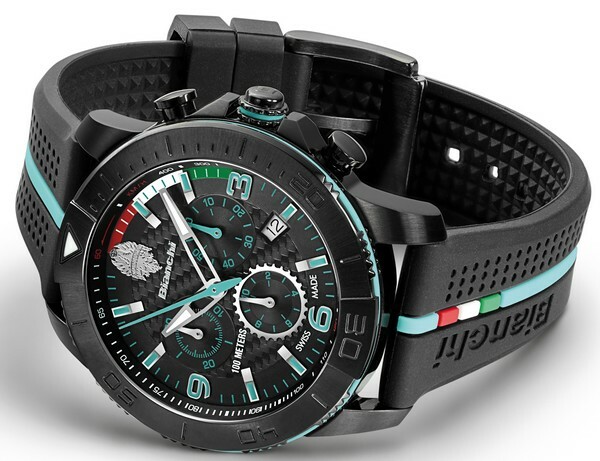 Created by an idea of Bian­chi owner Salvatore Grimaldi, the new Bianchi Timepieces collection is defined by Swiss quality, fun­ctionality, Italian design, material technology and innovation as the most distinguishing traits. Bian­chi Timepieces are created both for men and women and are true companions for everyday life. The first Bianchi Timepieces col­lection is inspired to Felice Gimon­di’s outstanding victory achieved at the road World Championship in Barcellona, in 1973. Gimondi’s win marked a step into the Bian­chi’s historical palmares. With the same spirit and passion, the Bian­chi Timepieces collection has been created to signal everyone’s spe­cial moment. Bianchi Timepieces include three contemporary sport watches, all 100m water resistant and with scratch resistant sapphire crystal: a sporting luxury-oriented Chrono with 43mm case and two active-style three-hands models respectively with 38 and 43mm cases. All models feature Swiss Made movement and are avai­lable in celeste, black and white colors.